Yesterday we told you about a lot of Assassin's Creed 4 game's details, but today we also have some great news. The developers have published an interesting Assassin's Creed 4 video with commentaries that shows the actual gameplay. And we would like to share it with you. The next installment of the popular action-adventure series will be much bigger than its previous parts. To finish all main missions, you will have to spend about 15-20 hours, and much more - to explore the beautiful world of this game. Gameplay Assassin's Creed 4 video demonstrates the charm of the project's graphics that has become not only more detailed and realistic, but also very interactive. The grass, the branches and the clothes will be moving together with you, the light and the mist will look extremely realistic and cool. According to the Assassin's Creed 4 video you will be able to pass 85% of the game in the stealth mode. The trees, bushes and other environments will help you to avoid your enemies, which are very strong and dangerous. But of course you will have some time for action. 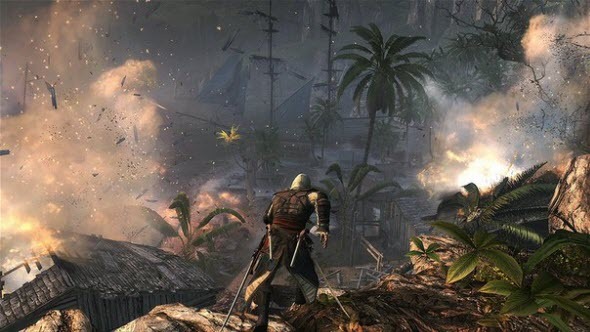 In the Assassin's Creed 4 video we can see some shooting and small naval battle. By the way, afloat you can use fire barrels, which help getting away from the chase; and you can move from one ship to another.